The original and still the best multivitamin out there, see the thing with vitamins is you really can’t absorb everything in one single pill. Different vitamins and minerals are better absorbed in conjunction with each other, and some combinations cancel each other out, also different stages of digestions are better suited to absorbing certain vitamins and so therefore a different type of deployment is better suited in some cases. All that and of course the simple fact that you can only really fit so much into one small compressed capsule. So all those years ago Animal launched this as a solution, and its been history ever since. This product covers everything and the kitchen sink, vitamins, minerals, adaptogens, antioxidants, a full amino acid complex, Nootropics & digestive enzymes. This is ideal as a cycle support as well, due to the fact it complements your liver support of choice with its anti-oxidants and of course it will help you meet your elevated nutritional requirements. Now these pills are hard to swallow – so you have two choices, either take them with food and man/woman up or thrown them in your smoothie and have them smashed into powder for you, makes for a bit of a funky flavour but its nothing terrible and it sure is easier on the stomach. A must have multivitamin for serious lifters. If you’re training or dieting hard for a contest, the first thing that happens when you don’t take the Animal Pak is that nutritional gaps begin to form. Why should you care? Because over time, these deficiencies continue to grow. Eventually, your body will stop functioning at its optimum level. In other words, you hit the wall, your development reaches a plateau. In fact, even if only one key nutrient is missing from your diet, your body could shut down the anabolic drive needed to build muscle so that it can support more critical metabolic processes. When this happens, you stop growing. 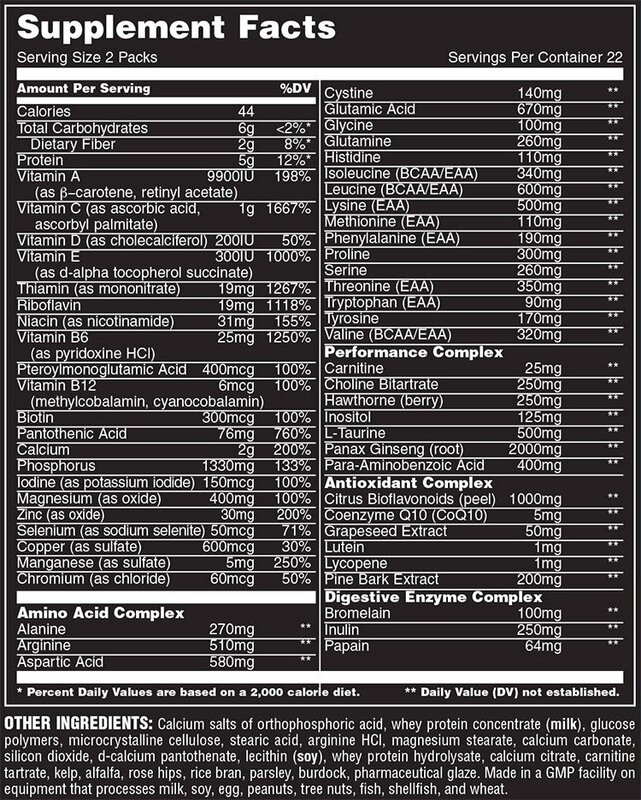 More alarming is the fact that championship-caliber bodybuilders, even when supplementing with a regular multivitamin, were still experiencing significant nutritional deficiencies. A basic multivitamin supplement won’t be enough. Competitive bodybuilders know that a superior multivitamin is the first line of defense. This fact is confirmed by studies which have revealed that 100% of Olympic weightlifters and over 90% of competitive male and female bodybuilders use a vitamin/mineral supplement like Animal Pak. These nutritional gaps not only affect your performance and size, but they begin to impact the way your other supplements work. For many of today’s supplements to work efficiently, your body needs to be running on all cylinders. Nutritional gaps mean that your supplements may be rendered ineffective. For example, many supplements rely on enzymes and other substances in your body to “activate” them. Poor nutrition means poor conversion and activation of expensive supplements. Animal Pak is your insurance policy to prevent this from happening. The Pak helps ensure you are maintaining an anabolic internal environment, one primed for muscle growth and optimum performance. Consider the Animal Pak as the cast iron skillet of your supplement program, your body’s first line of defense. If you train with weights, then you absolutely need to train with the Animal Pak. Remember, while most supplements have come and gone, precious few have stood the test of time. When you’re ready for the best, step up to the most trusted name in serious bodybuilding nutrition: Animal Pak. What IFBB pros and Mr. Olympia competitors have used since ’83. What the best of the best depend on, when the going gets tough, and every set, rep and meal matters the most.. The legendary Animal Pak.